A few weeks ago, I posted a short piece on An Informatics Theory of City Municipal Reform that asked a simple question — why hasn’t the combined momentum of the open government, smart cities, and civic tech movements dovetailed into some kind of larger campaign for fundamentally rethinking the way local governments are organized? Where are our model city charters for the Internet age? In a future post I’m going to details some approaches to what I think a model city charter for the digital age ought to look like. I’m going to come at from two approaches. The first approach will be inductive and retrofit-driven, taking the National Civic Leagues’s model charter and reworking it to address some of the key opportunities and challenges presented by technological change. The second approach will be a more deductive, tabula rasa approach based on a set of fundamental principles from which a new governance model can be derived. What are the core dilemmas we either need to solve or provide flexible mechanisms for ongoing adaptation at the local level, around which we can build up the basic functions required? I think the second approach will prove far more fruitful in the end. The way that most local governments are organized now, and this is clearly seen in the structure of their charters (e.g. ‘Article 7. Police Department, Article 8. Fire Department’), is premised on bureaucratic principles. These governments are designed on the idea that creating separated, functional organizational units with clear lines of authority, reporting, and accountability — and the corresponding information controls and technologies to support them — is the best way to achieve effective, efficient, and just outcomes. But we know that’s a very outdated way of thinking about organizations, and how to get things done. And it is anti-thetical to innovation. What we need a post-bureaucratic model for organizing the work of government, the core principles of that need to be articulated, and then the details of putting those principles to work doing the daily tasks of local govenment need to be fleshed out. This is big stuff — I await with trepidation the flurry of Locke, Marx, etc. references on the philosophy of government that are about to flood my inbox. But local government is a great place to start asking these questions becuase the philosophical quickly becomes mundane there. Success and failure are clearer and more immediate. So how do we start to identify what these key issues are that local governments need to resolve, from which we can derive all the rest — what fundamental assumptions do you need to establish before you can think through for instance, the best way to collect the trash, enforce laws (because from where we are starting, we are not even presupposing that establishing a police department is the right answer — that’s the bureaucratic answer), etc.? Just for illustration, let’s take a common experience with local government to imagine how this might work in principle and practice. How many times do you give one branch of a local government your address and then turn around and provide that same information to another department on another form? Sometimes its the same department. Sometimes — and this is maddening — you may even enter the same information multiple times on the same form. This is clearly a situation where the bureaucratic imperative (bend the world to our information processing constraints) has outlived its usefulness, and has highlighted a ton of other issues. How on earth can this government ensure the integrity of this data during the various coding, recoding and cross-referencing operations it will be put through? How can they secure it? So, Charter Reform Principle 1 is probably something about ‘Atomic and Autonomous Digital Citizen Identity’, by which I mean, you have one digital identity, and its yours. Maybe your city hosts it in a secure locker and gets to use it with your permission, but its a completely new compact from which all manner of good consequences will derive going forward. So that’s the kind of thinking I am trying to do. So how do we get to get to the full laundry list, and then narrow down to the core set of things this reform movement really needs to get right, and set in stone? I’ve been spending an awful lot of time over the last year thinking about how smart cities plan. It’s a nice change to shift from the noun to the verb part of the smart city grammar, if you will. So often, when people talk about smart cities, they mean the state of intelligence and ignore the act of thinking. It’s been kind of shocking how little attention has been paid to the process of planning smart cities, compared to the act of speculating about or designing their final state. It’s kind of crazy how big the gap is. Increasingly, there’s all this handwaving about citizen participation in making smart cities, for instance, but almost no one has any idea what the hell they actually mean by it. But a handful of cities have been focusing on this key process bit and doing some real, stakeholder-engaged planning. So in 2015 with funding from NYU’s Marron Institute of Urban Management, Stephen Lorimer at Imperial College and I published a study of seven cities’ efforts in a paper on Digital Master Planning: An Emerging Strategic Practice in Global Cities http://marroninstitute.nyu.edu/uploads/content/Working_Paper_25_Digital_Master_Planning.pdf. We learned a lot from that paper. There are big regional differences in the capacity, perceived value, and patience that cities have for planning in general, and especially this kind of planning which is usually advisory, and not required by statute. We learned that certain combinations of objective or policymaking/political appetite and resources and time lead to different styles of smart city planning. We identified four — facilitative, systems, learning, and interventionist. These were meant to serve as templates for thinking about the design of better processes for specific cities in the future, as well as foils to try to unpack emerging planning processes in cities around the world. 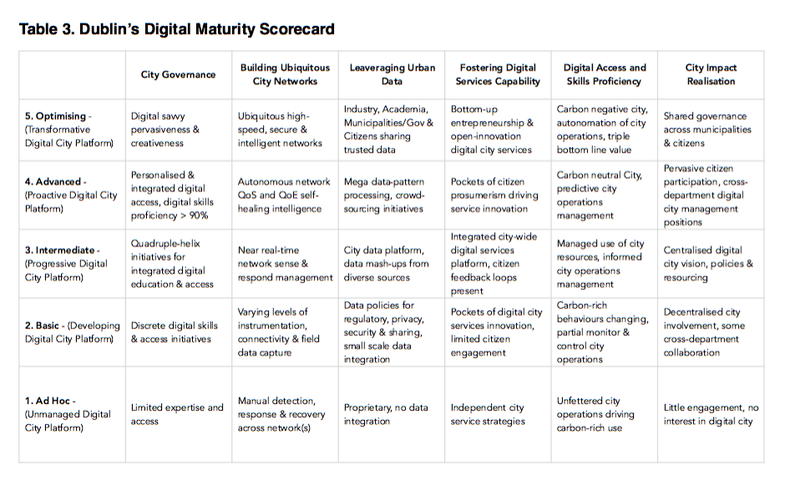 One of the more interesting findings along the way was a benchmarking tool released alongside Dublin’s Digital Masterplan, the Digital Maturity Scorecard (DMS). The DMS was basically a smart city adaptation of a tool widely used in the IT consulting world — and indeed, it was apparently developed in collaboration with IRI, a Dublin-based think tank closely affiliated with the Intel Corporation. As can be seen, these kinds of tools break down a complex organizational and technology landscape along two axes — functions of an organization and levels of maturity. Each box describes a set of capabilities that the organization should possess for that function at that maturity level. In practice, the tool is used to assess an organization’s current state of development, and identify where and how far it wants to advance its capabilities. Vendors then design a technology solution to deliver those capabilities, and often management consulting services to implement the changes needed to harness the solution as well. While my inclination is always to see every city as unique, I find these kinds of tools very useful — and infinitely more useful than indices based on arbitrary key performance indicators — because they show you where you are on a journey. Looking at the DMS, across the level 5, you quickly start to see the outlines of a Dublin city government that has used advanced IT to all but put itself out of business and delegate much of its authority and everyday operations to a distributed network of citizen-powered tools and new,networked institutions. This is exactly the kind of post-bureaucratic governance model I’m talking about. So now, the challenge really is to envision — what’s the charter that would actually bring about those kinds of institutions. Not just a charter that would not suppress them but one that would actually seed, encourage, and incubate them. These plans, and tools like the Dublin DMS, are fantastic maps for teasing out the initial list of dilemmas and core assumptions — charter principles if you will — that we’ll need to get nailed down. I plan to spend quite a bit of time on this exercise (in addition to the ‘lets retrofit existing charters’ exercise I mentioned as the first approach). I really need help with this and encourage you all to share your thoughts on the essential issues that local governments need to get a handle on — and again, we don’t need answers or solutions. We just need to tag the things that really need to be governed — the answer may be ‘establish a department that reviews and revises the rules on X every morning’ if that’s what it takes. The more I think about it, the more I realize that the process of maturing is really the right way to think about the smart city movement. And this focus on new charters is really my attempt to call attention to the need for accelerating and increasing the unit of change in that maturing process. Now, there’s a number of organizations that are working hard on pushing cities up this maturity hill. CityMart is figuring out how to help cities overhaul their innovation process from within. Bloomberg Philanthropies is driving hard to get city governments to focus on achieving measurable innovation. But its all too much within the existing framework of governance systems that are usually fundamental dysfunctional, structurally incapable of delivering. Digital maturity seems to want to engage a larger conversation about the transformation of governance that is missing. No one seems to be willing to go out on a limb — with the exception of the radical political movements like Podemos and Syria (but they haven’t engaged the smart city meme in any real way yet) — and call the whole incremental update campaign into question. (n.b. while the Pirate Party has engaged ‘smart’ in a legitimate way, they don’t represent a coherent political movement in my opinion). Now, I’ve been writing and speaking about smart cities for almost 20 years, and really intensely for the last five. And I’ve always struggled to find clear and concise ways to capture all of this complexity. Cities are insanely huge, global, multi-faceted, complex, and fast-changing. Ditto for digital technology. Put global urbanization and the internet together… and its just mind-boggling complexity of interaction to try to unpack. Smart cities — even more so than conventional urban planning problems — are, as Rob Goodspeed pointed out in 2014, the epitome of ‘wicked problems’. And I think this is why I’m so excited about the nexus of whats happening — with digital master plans, with the notion of digital maturity, and with this possibility of charter reform — because it finally gives the smart city a narrative that could be about more than just physical transformation. It’s a story with a beginning, a middle, and an end. A story that tells us something about where we’re coming from, what we’re missing — and where we’re headed and what we’ll gain (and inevitably give up), by getting there. This is the story that’s implicit in the Dublin DMS, and it needs to be made explicit. The smart city is about retooling local governments for the 21st century. It really could be that simple. The story has nothing to do with how you get your electricty or travel to work. That is the background, the setting. The foreground is how you vote, how you create your identity, how your society functions and values its members, the way we construct and manage the notions of public and private space. What justice, trust and equity means on the most intimate level, day to day, one neighbor to another. Like any story this one is full of simplifications, stand-ins, metaphors, and other devices that both enrich and simplify, inform and potentially deceive. But I think it engages. And if we’re at risk of anything in the smart city movement right now — its losing the attention of the citizens and policymakers we’ve spent a decade boring with endless, vague, and unfulfilled talk of efficiency, the IoT, and PPPs. This might just be a really roundabout way of saying that the smart city is finally ready to become a vehicle for radical political change.